The Haltbar 1001 Foundry carbide-tipped saw blade is a Type 1 bandsaw blade offering exceptional fatigue, shock, and wear resistance when cutting aluminum castings, fiberglass, Masonite, plastics, composite materials, and abrasive woods. The 1001 is no match for case hardened or spring steel, aluminum, nickel-based alloys, high-speed, duplex, and heat resistant steels. It is often referred to as a foundry carbide blade because of its common usage in cutting gates and risers. The Haltbar 1001 saw blade is used primarily for aluminum castings, Masonite, plastics, composites, and abrasive woods. Its set-tooth carbide blade is beveled, with a straight lead tooth set for high wear resistance. The design enables a smooth, trouble-free cut on all kinds of applications and features teeth ground from high-quality, micro-grained carbide cylinders welded to a tough, ductile backing material. The Haltbar 1002 carbide-tipped bandsaw blade is the answer to the most demanding production cutting applications. If high production rates are required, the Triple Chip offers great performance and a superb surface finish. Haltbar’s 1002 Triple Chip performs where standard bi-metal blades fail. It features an aggressive new tooth geometry incorporating the latest blade technology with teeth ground from high-quality, micro-grained carbide cylinders welded to a tough, ductile backing material. Both blades offer exceptional fatigue, shock, and wear resistance when cutting difficult-to-machine steels, high-alloy metals, titanium, stainless steel, Inconel, and in aerospace, steel service centers, or any production cutting environment. Haltbar 1001 and 1002 carbide-tipped bandsaw blades will make short work of other exotic materials as well. 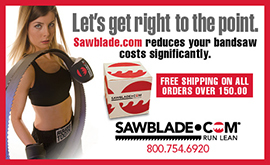 Visit SawBlade.com for all your specialized needs. This entry was posted in All Posts and tagged #bandsaws, 1001 series blade, Carbide-tipped, CT 1002, foundry saw blade, Haltbar, machinists, saw blades, sawblade.com, woodworkers. Bookmark the permalink.